A mix of clouds and sun during the morning will give way to cloudy skies this afternoon. High near 80F. Winds SSE at 5 to 10 mph..
Cloudy skies early with scattered thunderstorms developing late. Low 66F. Winds SE at 5 to 10 mph. Chance of rain 60%. 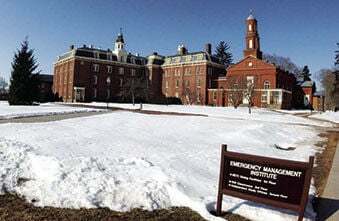 The Federal Emergency Management Agency (FEMA) runs its Emergency Management institute in Emmitsburg, Md.. It trains state and municipal officials, first responders, emergency managers and educators on disaster management and response. Denham Springs Mayor Gerard Landry said it is important that the city department heads and younger employees attend FEMA's Emergency Management Institute for the city will have the knowledge for the next 20 to 30 years. DENHAM SPRINGS – No sales pitch will be needed by Emergency Management Institute (EMI) instructors this week when they meet their class from Louisiana. Most of the class experienced the Great Flood of 2016, so they know why preparing for and knowing how to respond to a natural or man-made disaster is serious business, according to Denham Springs Mayor Gerard Landry. Landry is leading a group of 72 Louisiana residents on a four-day course at the EMI facility in Emmitsburg, Md., run by the Federal Emergency Management Agency (FEMA). The inspiration for the trip came from Denham Strong, the city’s volunteer group spearheading long-term projects to help the city recover from the flood. During the public meetings that led to Denham Strong’s plan, being prepared for future disasters was cited. EMI serves as the national focal point for providing emergency management training, according to it website. “EMI curricula are structured to meet the needs of this diverse audience with an emphasis on separate organizations working together in all-hazards emergencies to save lives and protect property,” according to its website. The group will spend Monday through Thursday, March 25-28, at the EMI facility, a former college converted to a training center. A maximum of 75 people can be in a group, Landry said. A total of 72 people signed up, with 46 from Livingston Parish. Twenty-five people are from Denham Springs, most with city government, while five are from Walker. Fourteen are listed as working with state agencies, most with the Governor’s Office of Homeland Security and Emergency Preparedness (GOHSEP). Having people with different backgrounds from different agencies is important, Landry said. “That’s what we hope for. It takes an entire community of volunteers and professionals to handle a disaster,” Landry said. Livingston Parish officials and agencies would need to communicate with other parishes and the state during an emergency, making their attendance crucial. “If there is another event, we will have better preparation and a better response,” Landry said. “The flow” of the response of municipal, parish and state officials is crucial, Landry said. “Someone might ask, ‘Why in the world are church people coming?’ ’’ Landry said. ‘Our churches are an important part of the process,” of disaster response, he said. Livingston Parish’s faith-based community responded in 2016, Landry said, so having their members take part in the exercise is important. The faith-based community’s buildings could serve as sites for evacuees, he said. The four-day course begins Monday with a welcome from Landry and an overview of the course by Meghan Van Aken, training specialist with the institute. A total of 13 units, or subjects, are covered over the four days. The group also will take part in a tabletop exercise, a functional exercise and be tested on emergency communications. The group will have three presentations on the first day: hazard emergency management and the planning process, Incident Command System and Emergency Operations Center connections and an overview of emergency management in Denham Springs. Van Aken will lead the group in the final class of the day, a tabletop exercise of an active assailant scenario. On Tuesday, the five classes involve public information and the media, documentation, human services, policy-level decision making, and an EOC communications test and preparation for the functional exercise. On Wednesday, there are only two classes, the first on critical incident stress management and the second, a 4½-hour functional exercise – responding to a hurricane. On the final day, Thursday, two classes are planned on recovery planning and a long-term recovery workshop. Populus, Jeanette Clark and Police Chief Shannon Womack will make a presentation on flood response efforts. The final class is a “Report Out – Way Forward for Denham Springs,” followed by a course summary and presentation of certificates. Although Landry is on the agenda to address the group and EMI instructors on the opening day, he said it will be a casual, “Glad we’re here” address. It’s what the participants hear from their instructors that Landry is looking for. “My intent is for the next generation of people working for the city, our department heads and others, to be prepared,” Landry said. “Our younger generation of employees needs to be prepared and know what to expect. These folks went through the flood of 2016,” he said. “Now we have better personnel who understand why we need the training. “If I didn’t do this, if I can’t help them prepare to mitigate the damage from an event, I have failed,” as mayor, Landry said.